More and more of my coaching work is around sustaining the gains. 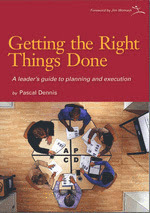 How do you get the right things done – and make it stick? It’s one thing to get strong – and quite another to stay strong. Sammy Obara, Darril Wilburn of Honsha, seasoned Toyota senseis, and our market partners for more than a decade, will be joining me.